Maggie Lux was born July 26, 1928, 4 miles SW of Fredonia, ND the daughter of John Lux and Maria (Heller) Lux. She was baptized at home and confirmed at Martin Luther Lutheran Church by Rev. John Bunge. She received her elementary education in the Haag No. 6 rural school and grew to womanhood in the vicinity where she helped on the family farm. 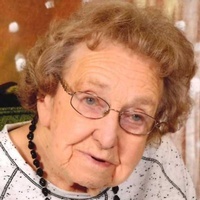 Maggie is survived by her 3 children, Delmer (Myra) Lautt and Alden (Janet) Lautt, all of Fredonia, ND; Marie (Glenn) Vogel, Kulm, ND; 6 grandchildren, Matthew (Kara) Lautt, Michael (Shanna Stecher) Lautt, Jenna (Thomas) Newman, Krista (Egan) Lundgren, Jacey (Caleb) Nill, and Joshua Lautt; and 5 great grandchildren, Brady Lautt, Art and Crew Nill, and Astrid and Hazel Lundgren; and 1 son-in-law, Richard Ovind. She was preceded in death by her parents, husband, 2 daughters, Carolina and Susan Ovind; 4 brothers, Arthur, John Jr., Edwin, Rolland and 2 sisters, Hilma Sheaffer and Lillian Mogck.